A dancer who lost part of her leg in the 2013 Boston marathon bombing is in hospital after being hit by a car. Adrianne Haslet-Davis, who is now a public speaker and campaigner, posted about the accident on Instagram. From her hospital bed, she revealed she had been crossing a Boston road when she was struck on Saturday. “Thrown into the air and landed, crushing the left side of my body,” she said in the post, which revealed she needed surgery. 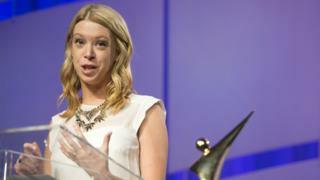 In her post, Ms Haslet-Davis described herself as “completely broken”. Further details about her injuries are not immediately clear, but Boston police told local media they were not thought to be life-threatening. Officials say the driver, who remained at the scene, had failed to stop on a marked crossing. The man, who has not been named, told police he had not seen Ms Haslet-Davis crossing because of dark and rainy weather, the Boston Globe reports. Ms Haslet-Davis was a spectator at the Boston Marathon and sustained life-changing injuries when two pressure cooker bombs went off near the finish line. Three people died in the terror attack, and many others were injured. The ballroom dancer lost part of a leg, but vowed to perform again despite the extent of her injuries. She went on to appear at a TED talk event a year later, and has also performed on US television show Dancing with the Stars. In 2016 she was one of two amputee survivors who returned to run the marathon. On her website, Ms Haslet-Davis says she refuses to be called a “victim” of the attack, and is known for using the hashtag #AdrianneStrong. In a series of posts on her Instagram story on Sunday, she thanked people for their online support. “I’m really scared and heading into my next surgery – I don’t know how many more there will be,” she said in the post.